The best shower of the year is known for its intense, colorful "fireballs." City dwellers have so much fun drained out of astronomical spectacles, with light pollution covering the celestial dome like gauze. 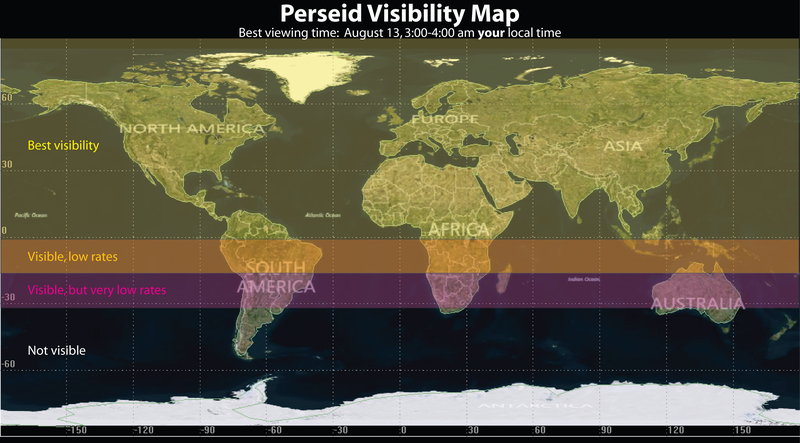 But tonight's long-awaited Perseid shower might be different, as the annual bombardment is known for its super-charged meteors that paint even hazy urban skies with plasma streaks. The impressive visual artillery of the Perseids relates to their source, Comet Swift-Tuttle, whose orbit is close enough to the earth that dust from its tail gets pulled into the atmosphere. The space detritus is thick and spiked with relatively large pieces, so that when it whizzes down at 132,000 mph it creates fireballs—intense, colorful meteors that can leave lingering trails of smoke and ionized air. During some years, watchers in darker rural areas can expect to see several of these ramped-up meteors and a flurry of smaller ones, adding up to 100 or more sightings each hour. To break those zones down into numbers, "best visibility" equates to 30 to 40 an hour in a dark environment, "low rates" is less than 10 an hour, and "very low rates" is less than five an hour. To increase your chances of spotting these flaming fliers, check out our guide to watching meteors in the big city. And if you want to hang with the big boys during the show, NASA will be holding a live-chat tonight beginning at 11 p.m. EDT.